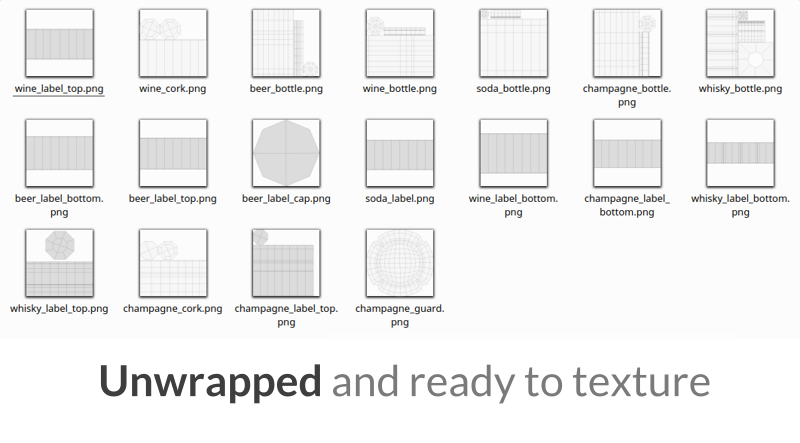 Bottles is a full scene pack including 5 bottles, designed to give you professional looking mockups with minimal effort. Show your designs (or your clients) in style! Each scene comes with 3 different cameras, each one setup specifically for that bottle object. The backdrop object comes with 10 different materials for different looks. These are infinitely customizable (thanks to Cycles nodes system) and can be used as a starting point to make your own. Each bottle includes 2 liquid objects: one for a 3/4 fill, and a full fill. Beer, Champagne and Soda bottles also include particle systems to simulate condensation droplets. Every label, cork and guard comes already UV Unwrapped, and all their UV layouts are exported into PNG files. All the placeholder labels you can see here are also included. The original SVG files and everything needed to change them are also included. The placeholders are released as CC0, so you can use them for anything you want. 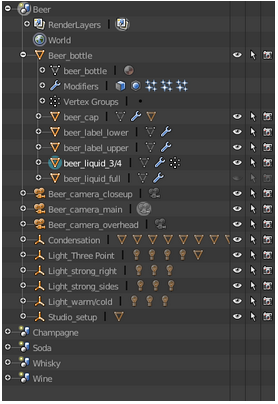 Makes the best use of Blender's scene system by having a scene for each bottle while sharing common objects like the backdrop and light setups. Every object is properly named and parented. Materials use node groups to share common node setups and lights are parented to empties to let you tweak them more easily. Take the advantage of using a mockup made in Blender. Objects are built using clean geometry and modifiers so you can edit them more easily. This mockup pack comes with a 21-page PDF explaining every detail. 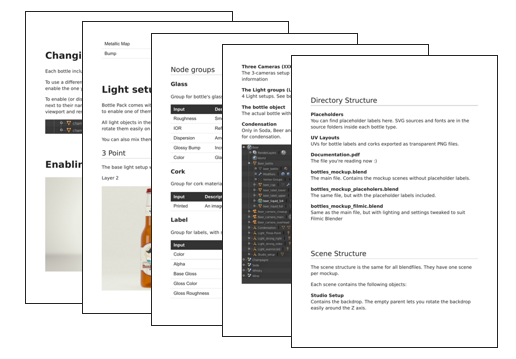 It also includes sections on making new labels, using the node groups and tips & tricks. I'm also available through the Market's inbox system to answer any questions you have. Includes every part of the bottle: corks, guards, labels, etc. If you’re having any kind of trouble, you can send me an email and we’ll sort it out ASAP. If you’re still not satisfied you can get 100% your money back. Need to make a similar but also very different mockup? I can help you! Send me an email and we'll talk it over. You can find the documentation in the included pdf file.